The idea of band members branching off and creating record labels is one that appeals to me quite a bit, as in theory it will lead to recommendations of new artists I was unaware of from groups I already like and follow. So when the members of Kylesa formed the vinyl/digital label Retro Futurist it seemed like a great thing, as that particular band has been one I’ve been enjoying for almost a decade now. 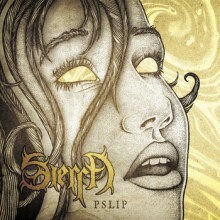 Retro Futurist’s first release is Pslip, the debut full length from Canadian stoner rock band Sierra. It’s the type of album that doesn’t reach its peak level until a little past the halfway point, but there’s a good deal of potential on display here and for a group that has only been around since 2012 I think they’ll be one to keep watching. Stylistically Sierra falls somewhere between stoner and psych rock with a few prog leanings towards the end and a healthy dose of hard/alternative rock hooks. It’s the type of sound that should be instantly appealing to fans of stoner rock/metal but also have a bit more mainstream appeal than that genre sometimes generates. What’s great about this combination is how natural the sound is, as it doesn’t sound like the instrumentalists set off to touch upon any one particular style but instead just started putting ideas together and this is how everything fell into place. Despite the appealing sound though, it took a few songs for Pslip to really sink in for me and this has continued to be the case on repeated listens. The earlier tracks are a nice balance of hook driven rock with some instrumental jams, but as you make your way further into the album the band begins to branch out further. Towards the end they present listeners with their two longest songs, where there are hints of sprawling prog/psych rock and full-on stoner grooves and I think at this point they reach their peak. This latter half of Pslip is what I’ve returned to the most, and while that doesn’t necessarily mean that the earlier tracks didn’t grab me at all it was enough of a difference to be worth mentioning. Lead singer Jason Taylor has a gruffer voice that’s well suited to the type of sound Sierra is going for. It’s a familiar one that has enough of a bite to instantly grab your attention, and I’m sure listeners will come up with a number of different comparisons to other stoner and hard rock singers that the performance reminds them of. The biggest difference here is that Taylor’s pitch never wavers and even when he mellows out a bit the energy is still there, which is one of the biggest issues I’ve found in a lot of other stoner rock. This genre’s home to a lot of vocalists that get off pitch rather easily, so it’s always great to find one that is not only in complete control all the way through but has real presence and is able to stand out over the instrumentals when needed. While the instrumental work does still have room for growth, Sierra seems to be right where they need to be when it comes to vocals. I really like the overall mix of sounds this band is able to pull off on Pslip and when they hit their peak level there are some absolutely killer riffs, but that didn’t happen quite as quickly as I had hoped. Sierra still has plenty of room left for growth, and with a few more years under their belt I believe they’re capable of putting out the type of album that will grab me from start to finish and have me coming back for quite some time to come. For now they’re pretty good though and still worth a listen if you’re looking for some stoner rock with a healthy dose of psych and alt-rock hooks, and it’s great to see the Kylesa crew give them support and provide opportunities to widen their fan base.